In this section we like to explain you how modern Application Management with Syntaro works. The following diagram will show you an overview about how the Syntaro service is working. The users can select the apps they would like to install in the Intune Company Portal. The company portal sends the request to the Intune Service. The Intune service triggers the Windows 10 built-in MDM agent to enforce the new requests. Windows 10 MDM Agent is setting the local configuration and start Syntaro App Management to enforce it. 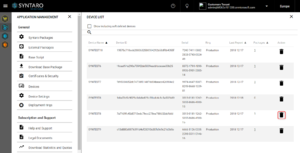 Syntaro App Management is the local functionality of our Intune extension and is built on PowerShell package providers and starts the installation, update or deinstallation. This layer also gives us the advantage to work with other package Providers like RuckZuck.tools, which is a great OpenSource Package Repository. Our Syntaro Package Provider is handling the package logic and is using the package information you provided in your private Syntaro Package Repository. It also allows to download content over BranchCache and save Internet Bandwidth. Microsoft Intune has limitations for application deployments. Only MSI files can be distributed and installed on Windows 10 MDM managed devices. Only a single file can be distributed with Microsoft Intune. This prohibits the deployment of complex applications packages. During application deployment data volume that is transported via Internet is very high and might break the Internet connection. Use the deployment rings which you user for Office or Windows also for phased deployments of Applications. Define actions to retry the installation for example when the applications is running or only install application when the devices meets some properties. 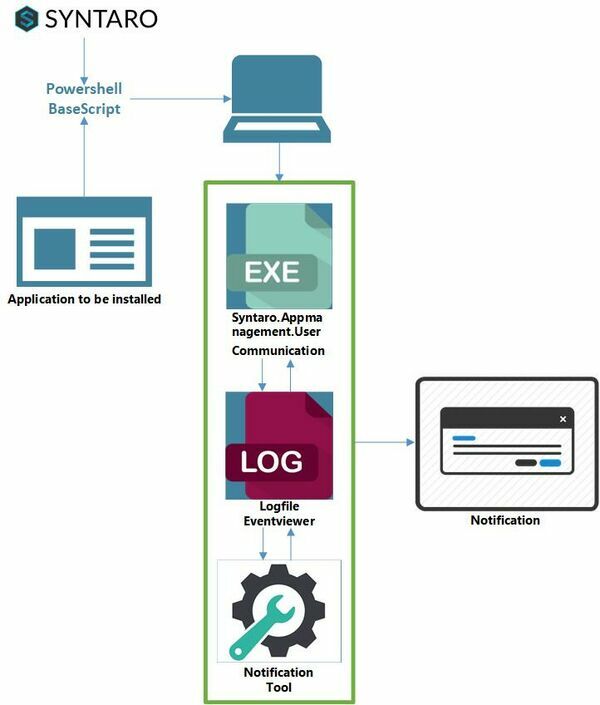 Trough the usage of PowerShell for the Installation and Uninstallation you can dynamically build the configuration according to your requirements. End User Interface to install applications with a store like experience. Cloud service of Intune which triggers `user requested` and `administrator defined` applications on the devices. 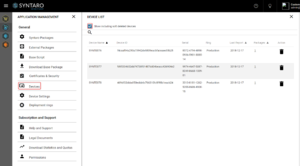 Checks regular intervals for new requests in the Intune service and installs the Syntaro Dummy MSI Package which triggers the Syntaro Scheduled Task. 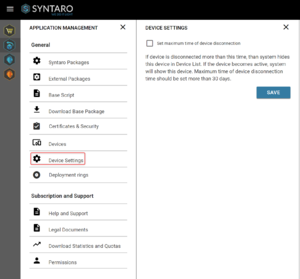 The Syntaro Base Package is responsible for the installation handling on the device. It consists scheduled tasks and also installs the Syntaro Package Provider. These package providers will allow you to benefit from cloud package repositories which already contain a lot of applications, which are ready to use. This provider will let you access your private Syntaro Package repository. This provider supports the built in Windows BranchCache. The package can contain as many files you need in your package and also the size can be bigger than every package you can imagine. The cloud service which is managing the repository and is answering requests of your clients. The Syntaro Base Script can be used to provide a set of functions to all of your packages. BaseVISION provides you with a really good one which can be copied from GitHub. The Syntaro Dummy MSI Package is a generated MSI file per Package, you define in our system and can be deployed with Intune to the devices. This placeholder MSI is also triggering the Scheduled Task to install the package instantly. 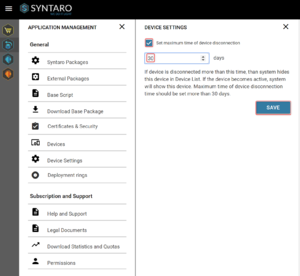 As of Syntaro release 1811, it is now possible to delete devices manually and set up a rule to delete devices that appear inactive, decommissioned, or unresponsive for a period of time of your choosing. This will cleanup for example devices that are registered double in your device list. This way you won't unnecessary reach your device quota. Click on "Devices" in the "Application Management" blade. This will open a new blade with a list of all the devices which are/were connected. In this case you can see that "SYNTEST8" is double in the list. You can make the difference between them by looking at the date that they were last connected. When you want to delete a device, simply click on the "bin-button". Once you have clicked on the bin-button, a window will appear to confirm your action. Once you click "Yes", the device will be deleted permanently. 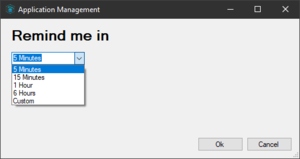 Click on "Device Settings" in the "Application Management" blade. This will open a new blade when you can check the option that will soft delete devices after a period of time. Soft because the Device will not be permanently deleted from the device list, but will be hidden. The deletion of the device is soft, because the device will not be permanently deleted from the device list, but will be hidden. Click on "Devices" in the "Application Management" blade. Here you can check the box that will show not only the connected devices but also the the ones who were deleted after the amount of time that you set. Check the box and choose after how many days you want the deletion to be set. Minimum is 30 days. Click "Save" and it's set! We have a new feature that gives you the option to send notifications to your users. For example: An application is being installed, but before it gets installed, the user first needs to close Outlook. Now you will be able to send the user a notification that they have to do that. Through a powershell script that you can update in the base script we provide, it will be possible to create this. The following diagram will show you an overview about how the new Syntaro service works. 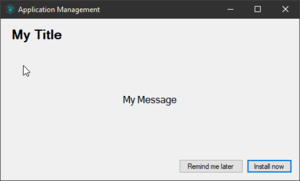 You can also expand this notification by giving the user 2 options: "Install now" or "Remind me later"
When you want to create a notification so that the user has to close an application, you can add this script (example). If the user closes the application, the answer that will be send is "true". When the user doesn`t response, it will send "false". If you have a machine that is not working correctly we have a little tool that collects Syntaro related information of that device. The tool is a simple small exe file that you can execute with regular user rights. That Information will be copied to a new folder in the current user's temp folder. In that folder, you can review all the information that got collected. The folder will also include a file called "_CollectedLogs.zip". If you want to open a support case with us that is related to software installation on clients, please also send us that Zip-File. If you get the Message "Windows protected your PC" please click on "more options" and then select "Run anyway"
This page was last modified on 29 March 2019, at 12:24.